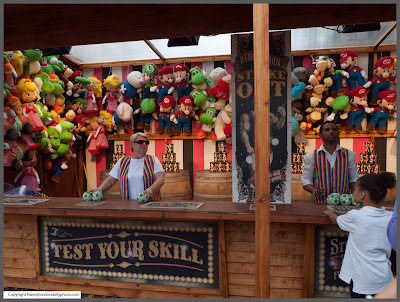 London Daily Photo: Roll Up, Roll Up! Anything from the top shelf! The ride yesterday is part of a very self conscious effort to turn the corner of green by the London Eye into a mini Colney Island. The cost of the rides is a little off putting (a couple of minutes on the high roundabout costs £7) and your chance of winning anything at this stall is as likely as at any fair, but I have to confess the cooking at the food stalls really smelled good. Comments on "Roll Up, Roll Up!" Would you be refering to New York's 'Coney Island'? The name was originally Dutch. Dutch colonists hunted rabbits on this island. In Dutch, the word for rabbit is: "conje".